An interesting partnership between UK mobile operator Three and The Times will see mobile broadband subscribers offered free access to both The Times and The Sunday Times websites, available to new customers until March 31 2011. Currently, the offer is only available to Mobile Broadband customers over a three month trial period, meaning that pay-as-you-go and monthly mobile subscribers will not be able to take advantage of the deal. 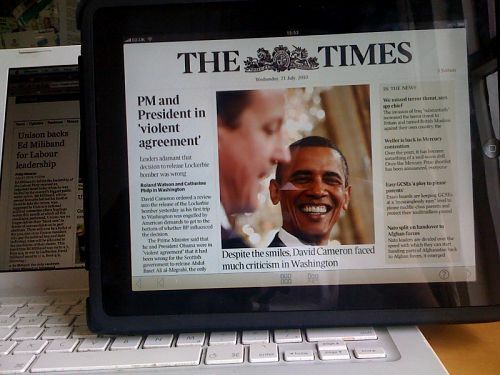 Instead, customers will be able to scale The Times’ paywall using their laptop or tablet device, including The Times iPad edition. Once the three month trial period ends, pay-as-you-go customers will continue to receive free access to the The Times should they top up at least once every 30 days, whereas contract customers must pay add a £2 weekly subscription to their direct debit for access to both titles. Newspapers has been increasingly shifting their strategies to include mobile but none have specifically partnered with a mobile operator to provide unrestricted access to otherwise premium content. News International (owner of The Times) recently released its first figures since it erected the paywall to encompass The Times’ websites, over 105,000 people had subscribed to view its editorial content. Whilst the figures looked high, half of that figure included readers that had bought a day-pass, including purchasers that had requested access just to see what the website was actually like. A paywall has since gone up to restrict free access to The News Of The World’s website. Three has previously announced a deal with Facebook by way of the social networks’ Facebook Zero product. We are left wondering how News International will report the additional subscribers and whether other newspapers will begin to maximise exposure via deals with mobile operators. The Guardian has recently started charging a monthly subscription for its iPhone app, could a operator deal follow?